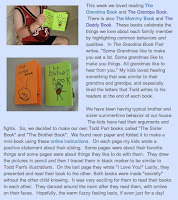 My children love all kinds of books, from chapter books, to graphic novels to picture books. Today I asked my daughter why she likes books by Todd Parr, as we were preparing to celebrate his birthday as a family. She responded, "I love the pictures, they are really colorful!" Todd Parr's books contain simple text and bright pictures that grab the reader's attention. They are a favorite around our house! The words, "Peace is helping your neighbors" from The Peace Book by Todd Parr inspired us to spend this morning helping a family member with yard work. The job was just too big for one person to handle. We surprised the family member with a phone call this morning, asking if we could come over (all 5 of us!) and help tackle the job. My children helped trim bushes, rake leaves and grass, and pick up sticks. We worked for over two hours and then my daughter proclaimed, "I feel good when I help someone who needs help." For my wife and I, peace is hearing our daughter say this. 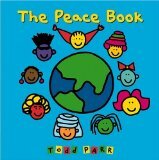 I will be giving away a hardcover copy of The Peace Book to celebrate Todd Parr's birthday. I want to keep the contest very simple. Post a comment below about a time when you performed a random act of kindness or when someone helped you when you needed help. Make sure you leave an email address (i.e. happybirthdayblog at att dot net). I will pick a winner on July 17, 2011. 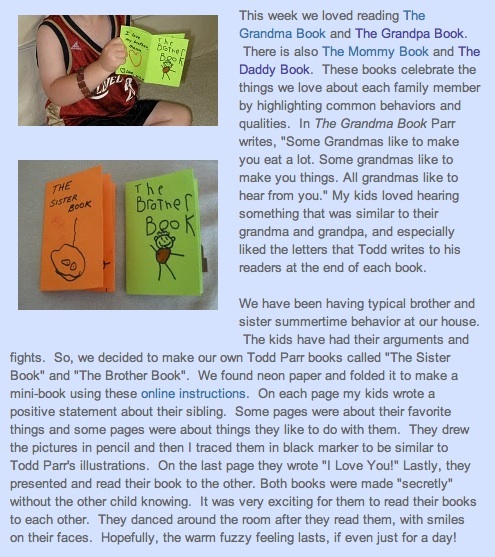 Last year, my children made The Brother Book and The Sister Book fashioned after Todd Parr's The Mommy Book and The Daddy Book. Click here to view the 2010 Todd Parr Birthday Celebration post. My children made these books "secretly" then presented them to each other. 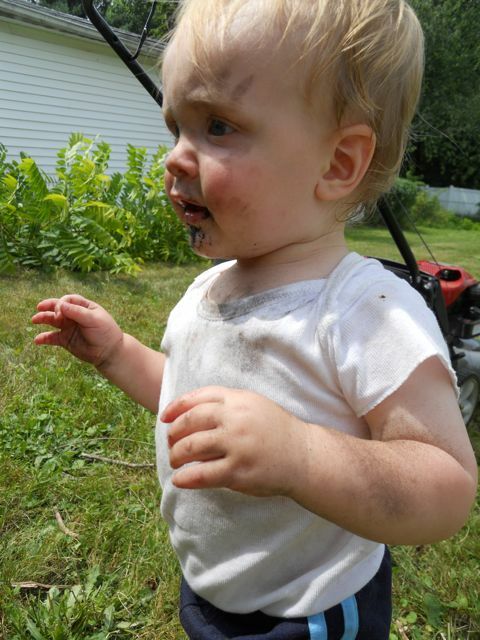 The little guy helped out by eating the dirt during our backyard clean up today! 4. Follow Todd Parr on Twitter and Facebook - He is very active on these sites! My kids love Todd's My Underwear App for iPod, iPhone, and iPad. I even like to play the game too! Check out the Apple App store to buy for only $2.99 + lots of other cool stuff from TODD! Peace is having your kids understand that things done for other people make them feel good. Peace is seeing your son eat dirt, and your daughter get wipes to clean him up without being asked. This was a wonderful activity to show acts of peace. The contest is now closed. Congratulations to AVR. I will be in contact soon to get you the prize.